Remembering a chance pitstop at a restaurant while driving through the panhandle of Florida a few years ago, I recalled something I have been dying to recreate…. A crawfish cornbread! The crawfish cornbread I had was the size of a brick, and light as a feather. Big huge chunks of fresh crawfish, peppers, aromatics, exploding with flavor. The cornbread was served alongside a man-sized bowl of red-beans and ham and I was in heaven! What a perfect marriage of two ideas… and fortunately for my clients a delicious lunch! 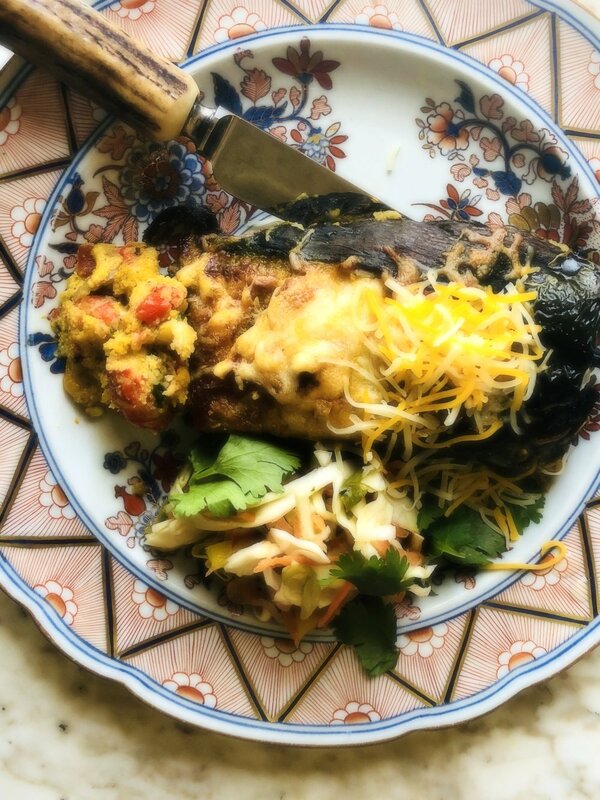 Start out by roasting/charring your poblano peppers. Place them on the open flame of your gas stove, an outside grill, or rub with oil and blister them in your oven with the broiler. Your best bet if this is new to you, would be to YouTube this process and watch how it is done. Once the peppers are blistered and charred, place them in a ziplock bag to steam. Once cooled remove the peppers from the bag and rub off the charred skin with a paper towel leaving the flavorful smokey poblano behind. Set aside and start working on the stuffing. Now for the crawfish corn stuffing: In a mixing bowl add the cornmeal, baking soda, and Cook’s Line Seasoning or salt and pepper to taste. Mix to combine and set aside. In a large sauté pan add a little olive or grapeseed oil and begin to heat. To the pan add the diced onion and pepper and begin to cook. Sprinkle in the Barbacoa Seasoning, or you may season with a combination of chili powder-cumin-salt and pepper to taste. Cook until tender and fragrant. Set aside. In the same mixing bowl as the dry ingredients, add the two beaten eggs and the entire can of creamed corn. Mix to form a sticky batter. Next scape in the sautéed onion and pepper mixture from the sauté pan along with three tablespoons of finely chopped cilantro. Mix once more completely. Add the crawfish tail meat along with the shredded cheese and fold into the batter evenly until you have a proper batter. Remove the charred poblanos from the ziplock bag and rinse under cool water while rubbing off the charred skin. With one slit lengthways down the pepper, rinse out the seeds and remove the white (pith) membrane. Hopefully, you knew to wear latex gloves while doing this BEFORE you got to this part of the recipe. If you did not just don’t rub your eyes, nose, or any other “vulnerable” part of your body for a while. Once the peppers are cleaned, and in a relatively whole piece, fill each pepper with the crawfish-corn batter. With four large peppers, you may have a little leftover batter. Bake the remaining batter in a cupcake tin (oiled on the inside first) for a little extra treat. Preheat your oven to 375 degrees. Place the stuffed peppers into a well-oiled casserole dish so they’re closely nuzzled in next to each other. Top with extra shredded cheese and cilantro. Place the dish into the heated oven and bake uncovered 18-20 minutes or until the crawfish corn stuffing is firm to the touch and fully baked… like a cornbread. Remove the peppers from the oven and serve warm with a crunchy slaw or beans. Enjoy!